This review first appeared in the October 9, 1992 issue of the North County Blade-Citizen (now North County Times). Chip Davis, the man behind Mannheim Steamroller, has released the third volume in his new series of theme albums, Day Parts. "Party" is equal parts light jazz and new age. TV show theme writer Mike Post contributes several breezy pop jazz pieces, Davis tosses in two Steamroller-like cuts, and the band Checkfield does an interesting cover of The Beatles' "You Won't See Me." This isn't a concept album the way most Chip Davis albums are; the unifying themes here are intellectual, not musical. 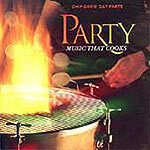 Too, the album is too cerebral for a party soundtrack  the songwriters tried to capture what a party is, rather than just letting go and, well, partying. The Day Parts series is "designed to accompany various occasions in our lives," according to a press release from the label, American Gramaphone. While "Party" is nice enough, you might be better off putting on some old Ohio Players (or Johnny Mathis, if your speed is a little slower) for your next get-together.